Is Vinyl Really Making A Comeback? It is understandable that after more than a decade of doom and gloom, the music industry has been trumpeting the fact that sales of vinyl are rising, and rising fast. But just how big an impact are these increased sales having on the industry as a whole? Is this a trend that looks set to continue, or is it just a fad? The fact that Urban Outfitters is one of the leading retailers of vinyl in the US does lead you to wonder whether people are buying records as fashion accessories, rather than as albums they’ll actually play. Below, we take a look at the vinyl renaissance and try to determine what effect it is having on the music industry. The fact is, that year-on-year vinyl sales are soaring in some of the worlds biggest markets. In 2007 1 million vinyl albums were sold in the USA, in 2013 6 million were sold. Figures just released by Nielsen SoundScan reveal that in 2014 9.2 million vinyl albums were sold. This is a rise of over 50% on the previous year at a time when both physical sales as a whole, and sales of downloads are both plummeting. Streaming services saw an increase of 54% in the same period, so it seems obvious that streaming is having a big affect on the sales of mp3s. It seems that ‘owning’ a digital music file is not something that people are overly bothered about, if they can easily access that music another way – say through Spotify or Pandora. Owning a physical object, a vinyl record, is however something that seems to be increasingly desirable. And it is certainly not just in the US where vinyl is on the upturn. In 2014, vinyl sales in the UK passed the 1 million mark for the first time since 1996. This brought the UK music industry revenues of more than £20m – up from barely £3m five years earlier. 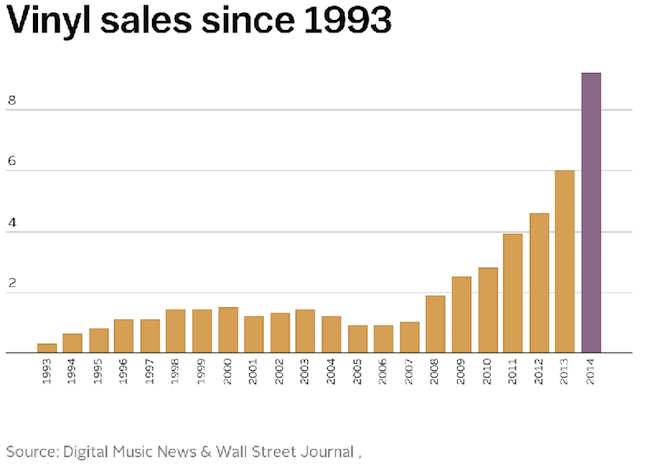 Below is a graph of US-only vinyl sales since 1993 – the trend here is very clear. We need to look at these numbers in context however; these 2014 numbers are certainly astonishing, and the rise of vinyl is remarkable in many ways, but the format still only accounts for a tiny proportion of music sales. 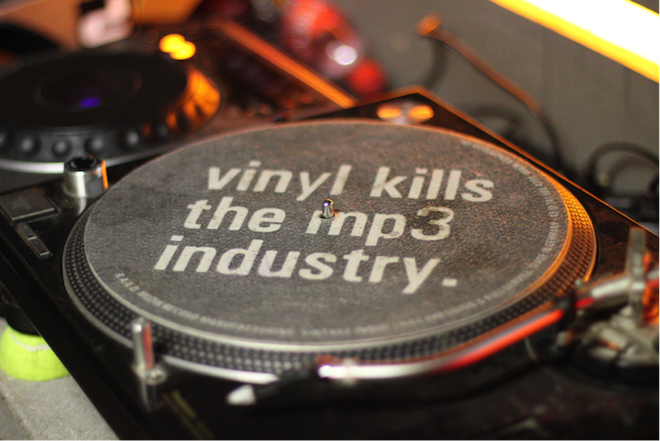 Those UK vinyl sales for 2014 only account for 2% of the overall music market. The 9.2m vinyl albums sold in the US? That’s just 3.6% of the total albums sold. So while these numbers are undoubtedly good news for many, vinyl does not look to be the saviour of the music industry. Can These Numbers Continue To Rise? Unless a huge investment is made into infrastructure, the short answer is – no. The Vinyl Factory interviewed a number of record labels who they deemed to be ‘pushing vinyl forward in 2014’, and Steve Viaduct from San Francisco’s Superior Viaduct records identifies a key problem; “Don’t get me wrong. I’m glad that vinyl is back, and Superior Viaduct definitely sells more vinyl than CDs. The problem is that, while vinyl manufacturing has increased, there is a finite number of machines to press them. Every time a major catalogue like The Beatles is repressed or every Record Store Day, all the pressing plants are completely backed-up”. In a fascinating piece for The Guardian, John Harris profiled Optimal – a vinyl pressing plant that claims to be the biggest in Europe. Based on an industrial estate in Röbel, Germany – 90 miles north of Berlin – the plants vinyl presses run 24 hours a day for most of the year. Optimal’s machines are old, as are the machines at most vinyl pressing plants worldwide. The company are working at capacity but cannot afford new machines – as demand for vinyl continues to rise, who is going to press it? It is only the major labels that have the financial muscle to be able to invest in new presses, and so far, they remain unconvinced as to the commercial potential of what is essentially still a niche market. It is difficult to see vinyl sales continuing to rise at the same rates for much longer unless this changes. A Lifeline For Indie Labels? So if the majors still only see vinyl as a niche market, albeit an important one, then can it be something more for indie labels? Many small indies are real labours of love, and one of the reasons many people get into running labels in the first place is to press up their own vinyl. There is still a romance associated with the medium that simply does not exist with digital downloads, and the vinyl resurgence may not make the owners of these labels rich, but it may allow them to break even for a little longer – and that is good news for any music lover. It’s not just these smaller labels that are prioritising vinyl either – there are an increasing number of artists choosing to release only on vinyl, a number of whom were profiled by Mixmag last year. Leaders in this field are house artists ItaloJohnson, whose self-released vinyls top record store sales charts all over Europe. Their website contains a manifesto of sorts: “ITALOJOHNSON believes in the principle of simplicity and tangibility. Vinyl is the medium, of which this principle and passion will be shared and passed on…” Vinyl means something to people – it is hard to think of any artist writing ‘passion’ and ‘mp3’ in the same sentence, as ItaloJohnson do, above. Perhaps the vinyl comeback has been overplayed in some circles – this is still a small movement, and it doesn’t yet have the capacity to be much more than that. However, these increased vinyl sales are allowing acts and labels at the fringes of the music industry to sustain their passion-projects for a little longer – and allowing some of them even to flourish. This is surely great news for all of us.